I have been looking at this picture a lot this week. I posted it to several F4 facebook groups. It shows me standing in front of an F4C parked on the ramp at Luke Air Force Base in Arizona 45 years ago — spring 1973. 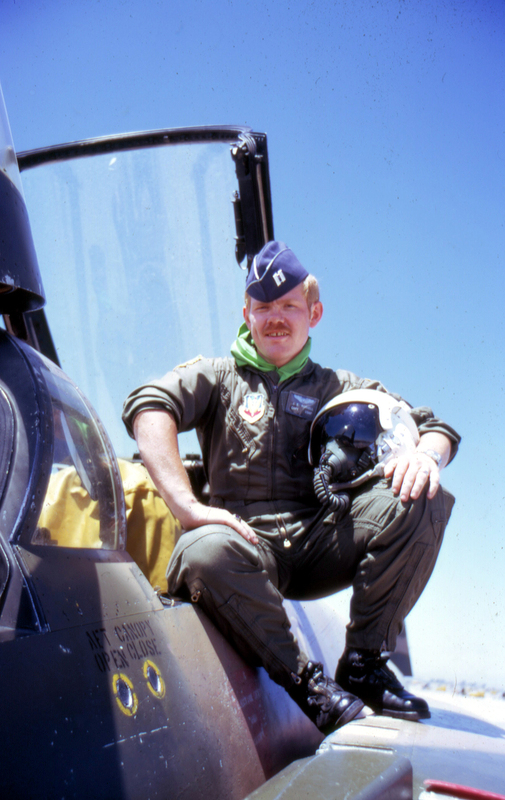 I had just completed nearly two years of flight training, which began in the fall of 1971 at the Navigator Training School at Mather Air Force Base. When I graduated from Nav school I asked for the F4 and I got it. 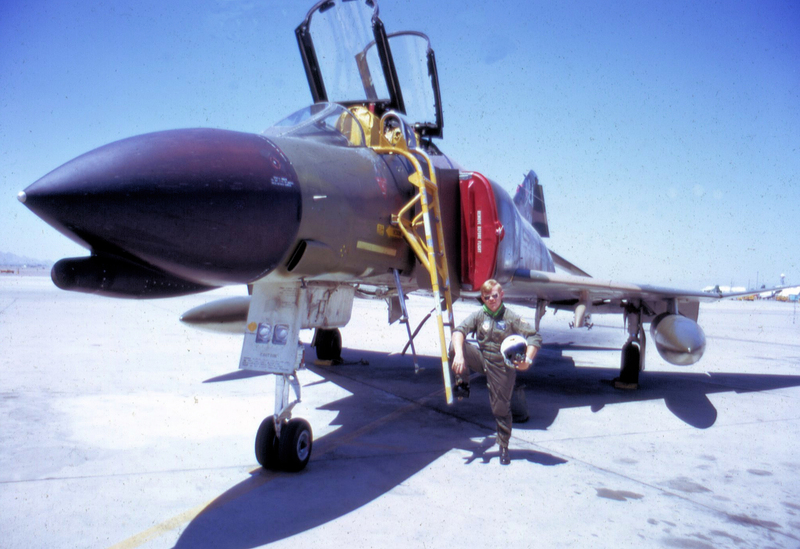 By May 1973 when this was taken I had been through additional training to qualify in the Phantom. This training changed me from a navigator to a Weapons Systems Officer who ran the radar, INS, navigated, flew the aircraft from the back seat, conducted complex intercepts of approaching aircraft, and that was only the beginning. I had come to the F4 late in life, I had been a non rated officer or groundpounder as we called them for 4 years. While most of the men I was in training with were 22 – I was an old guy at 28, When I picked the F4 I really knew little about it or the demands it would place on me. In my six years in the Phantom, I came to realize it was more than just being a Guy in Back — GIB. It was being admitted to a very special fraternity – the world of the fighter pilot. The fighter pilot was a direct descendant of the famed aviators of World War I who took on the likes of Red Baron over the battlefields of France. Fighter Pilots — they lived life to the fullest, the flew hard, high, and fast. They were almost to the man, some of the best people I have ever known. They partied when the job was done and then went back into the air the next day to do it again. This is not to imply that they were not professional. I never met an F4 front seater that was anything less than professional in the air. I came to respect their skills and see that they alone in the Air Force occupied a unique place shared only by their brothers in arms — the F4 recce pilots and the Wild Weasels who lured the enemy into shooting at them– so that others could attack their position. As a GIB, I was right there with them. If my AC flew high, hard, and fast I was two feet behind him, his partner as we took on all that the enemy had to throw at us. And there was more to it than this, we understood each other, we knew what each one was going to do almost before he did it. It was a unique time as a Nav to be so valued as a partner. I would never feel that again when I left the fighter world. As I look at that photo, I see someone who is proud and confident. Yet, I was unaware what a year in combat, and four more years in the Phantom would bring. Of the changes it would bring to me, how my skills would grow, and how I would never be able to forget those days. How I would never be able to forget those days. It was the great adventure of my life. This entry was posted in 13 TFS, 43 TFS, Air Force, Alaska, American History, Arizona, F-4 Phantom II, F4 Phantom II and tagged Fighter pilots, GIB, SEA, Thailand, Udorn RTAFB, WSO. Bookmark the permalink.